Instant Imprints Kennesaw, GA | Custom T-Shirts, Embroidery, Signs and More! At Instant Imprints Cobb Place in Kennesaw, Georgia, our customers come to us when they want to be more visible to their customers. We create that visibility five different ways: Branded Apparel (embroidery), Signs & Banners, Promotional Products, Custom T-Shirts and Print Services. Excellent customer service, from my initial phone call for a quote for some wedding signage, to my visit the next day. They definitely take pride in what they're doing and great pricing, I called a few other printing services and they couldn't be beat. If your brand is looking to step up its visibility with custom t-shirts, printing services, promotional products, custom banners or branded embroidery items, Instant Imprints in Kennesaw is your source! Our Cobb Place Showroom is full of example items you can check out, so you can be inspired to brand some unique items. Just ask Siri, Alexa or your Google Assistant, “Where’s the best place for promotional goods near me?” Your Cobb Place Instant Imprints will be at the top of the list! At Instant Imprints in Kennesaw, we are proud to serve local businesses as well as those looking to promote events or sports teams. Building team spirit has never been easier with the superior branded goods that your Cobb Place Instant Imprints can provide! Our local Image Experts are happy to answer any questions you may have, while seeing your project through from start to finish. Best of all, your goods are produced entirely in-house, right here in Kennesaw. Custom t-shirts are a great way to bring your brand to the masses. This is why virtually every major brand has a custom t-shirt design of their own. When you want to give your logo the power to travel, just provide your loyal customers or employees with some custom tees to show off. Wherever they go, they’ll be taking your brand values with them! In addition, if you’re looking to spice up your work attire or sports uniforms, our custom embroidery service can provide an exquisite level of style and durability. 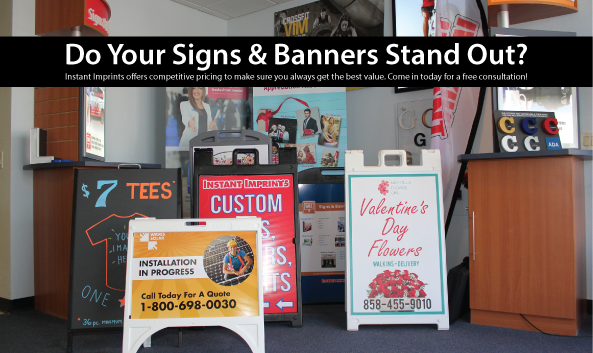 All across Georgia, business owners and promoters know the value of custom signs and banners. They’re a fantastic way to stand tall amongst the competition, and reach your prospective customers wherever they may be. You can invite passersby into your storefront with a personable sidewalk sign, or advertise to motorists with a banner fit for the freeway. The durability and portability of custom banners and trade show displays means that you can utilize them wherever they are most effective, indoor or out. When it’s time for your business to reach a whole new level of brand visibility, look no further than Instant Imprints in Kennesaw. Stop in at our Cobb Place Showroom, give us a call at (404) 913-4344 or request a quote online today!